The Wolfeboro Pioneers is one the last surviving local BSA honor society in the United States that has not been absorbed by the Order of the Arrow, the others being Tribe of Mic-O-Say, Firecrafter, and Tribe of Tahquitz The Wolfeboro Pioneers is a Boy Scout camping honor society based out of Camp Wolfeboro near Arnold, California. The society was founded in the summer of 1929 by returning Scouts and Scouters who were devoted to creating and preserving the camp's unique tradition. An insight into the society in 1996 is given by a Scouter on the Scouts-L list. Beginning in the 1930s, the Order of the Arrow absorbed many of the small Boy Scout honor societies that had thrived during Scouting's first two decades. This happened in 1944 in Silverado Council. The Order of the Arrow established itself in Mt. 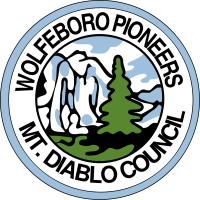 Diablo Council in the early 1950s. Every summer, it inducts several adult leaders and roughly 100 Scouts, a good annual induction rate for a minor organization. These Scouts come not only from California, but from around the nation and world. Since then, individuals have been inducted into the society through election. Eligible Scouts are nominated by the Scoutmaster and elected by their troop. The number of Scouts eligible per troop depends on the number of Scouts in the troop rounded up to the closest tenth then divided by ten (i.e. if the troop size is 30, then three Scouts are eligible, if 21 then still three Scouts are eligible). Elections are conducted in pairs by Pioneer members (usually uniformed) who disperse throughout the various campsites. The Pioneers are responsible for reading and explaining the election procedures to the assembled Scouts. The Scoutmaster has the ability to veto the troop's decision. Votes are then taken back to Pioneer Rock where they are counted by Pioneer officials. Originally only the initial returning Scouts were "pioneers" and for a number of years no one was added to their number. The society realized that if they were to survive it would be necessary to induct new members who possessed the same spirit of the original pioneers. The original procedure was that if a Scout met the requirements described above and had worked on at least one pioneer sponsored work party, then he was eligible for nomination. Prior to the final campfire of the week the pioneers would gather on pioneer rock and nominate candidates and plead their case. Upon end of discussion, a vote would be taken. To be eligible for candidacy, Scouts must have spent two weeks at Camp Wolfeboro, one of which must have been in a previous year. They must have held (or be holding) a position in their troop that is on the approved list for Eagle within the Boy Scout Handbook 11th edition, p. 446. They must also be First Class rank or above and have Scoutmaster approval before eligibility can take effect. Some troops, due to unusual size or other quality, amend these eligibility rules. For example, some troops choose to nominate only Scouts that are Star or higher. Scouters/parents must be nominated by a member of the troop they are camping with. The nomination must be seconded, and thirded by individuals present at the Thursday night Pioneer meeting. The only requirement for adults is that they have spent two weeks at Camp Wolfeboro, one of which must have been in a previous year. Unlike in the election of Scouts (excluding Venturers), females are eligible for election. Shortly after the final dinner on Friday night, Scouts assemble at Bravo How campfire circle at the foot of Pioneer Rock. The ceremony begins with the Pioneer historian giving a short history of the camp and the organization. After that, the Pioneers, assembled on the rock, lead the Scouts seated on the logs below in singing the traditional song, "Patsy Ory Ory Ay." When this is completed, the Pioneers slip away and form a ladder on either side of the trail leading to the main campfire circle. In a matter of minutes, the Scouts, Scouters, and parents who have come to watch the event form a column behind a number of Pioneer torchbearers who lead the way to the main campfire circle. The Pioneers lining the parade route hold their fingers in the Scout Sign and stand at rigid attention to signal the somber nature of the event and to call for observance of its importance through absolute silence. The Scouts are seated and the Pioneers disperse and retreat to the second Pioneer Rock, situated so that it overlooks the main campfire circle. The Pioneer Sergeant-at-Arms, breaking the silence, decrees in a booming voice: "Let The Fires Of Friendship Burn!" The campfires are then lit and, for the next hour, Scout troops perform songs and skits for the assembled crowd. After the skits have finished, the Calling-Out Ceremony begins. The Pioneers form a human "ladder" that runs from the stage to the top of Pioneer Rock. Each Scout is called out and is helped up the ladder to the top of Pioneer Rock. Along the way, they are congratulated by current members. After the ceremony ends, they embark on an initiation process that takes until the early hours of the morning. The Wolfeboro Pioneers' official mission is to preserve and improve Camp Wolfeboro and its traditions. To this end, the Wolfeboro Pioneers assist in the opening and closing of camp each summer, as well as assisting in multiple service projects throughout most summers (in addition to the Camp Wolfeboro Workparty each Tuesday evening). Examples of the work the Pioneers have done include the maintenance of the road into camp, as well as the refurbishments of the dining hall in recent years. The Pioneers are also responsible for at least 90% of the trails within camp. A second duty of the Wolfeboro Pioneers involves the preservation of the history of Camp Wolfeboro through the creation and maintenance of the Pioneer scrapbooks, as well as the writing and printing of "Wolfeboro Sings", the official songbook. The scrapbooks are currently updated through the summer of 1998 and contain photos, clippings, and patches from the camp's history. Currently (as of June 2007) the Pioneers are actively working on updating the Camp Wolfeboro history since 2000 in the scrapbooks, as well as pursuing a new edition of "Wolfeboro Sings." There are three Pioneer rocks. One in the center of camp, one at the main campfire circle and a third secret one. No one is permitted to walk on the rock unless they are a Pioneer. The official color of the Wolfeboro Pioneers is "Pioneer Blue," which currently most closely resembles azure. The actual color of the Pioneers has varied considerably over the 75+ year history, ranging from teal to darker royal blue. Many pieces of Pioneer apparel have been created over the years since 1929, including t-shirts, polos, neckerchieves, and fleece jackets. As well, a large variety of patches, designed primarily for the temporary insignia location on the right breast pocket of the Boy Scout uniform, have been issued, most of which can be viewed at camp in the Pioneer scrapbooks. Mount Diablo Silverado Council (SVMBC) (local council #023) of the Boy Scouts of America operates this scouting district. It serves the four California counties of	Contra Costa County, Lake County, Napa County, Solano County and northern Alameda County. Camp Herms is located in El Cerrito, California. This camp serves as a year-round camp with Cub Scout Day Camp during the summer. It is situated atop the El Cerrito Hills and can be used as the hub of local historical site visits to San Francisco and the surrounding area. Camp Herms was originally named Camp Berkeley and opened for use in 1930. The camp was renamed Camp William B. Herms in 1939. Camp Wolfeboro is a resident boy scout summer camp located on the north fork of the Stanislaus River near Bear Valley. Operates a eight week summer program followed by a six week fall program. Home of the Wolfeboro Pioneers. ↑ "Archived copy". Archived from the original on April 13, 2008. https://web.archive.org/web/20080413075535/http://usscouts.org/honorsociety/wolfeboro.asp. Retrieved 2008-10-02. ↑ "Archived copy". Archived from the original on March 9, 2016. https://web.archive.org/web/20160309190330/http://wolfeboropioneers.org/. Retrieved 2016-05-30. This page was last edited on 25 December 2018, at 17:55.